Expert Review of Children's Kiddush Cups by N/a, one of our picks of the top Jewish books for kids! A hand-picked index of books, CDs and toys for children and parents, including the best Bar and Bat Mitzvah gifts! ✔With reviews by Goldy, a teenarger who has read them all (well, most of them anyway). Looking for Jewish books for kids? Need Bar and Bat Mitzvah gifts? 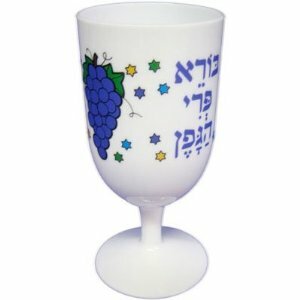 Children feel Shabbat is special when they have a special cup for kiddush. A true “kid”-ish cup!! Goldy says: all kids love to have their own special kiddush cup! This site is a public service of Jewish Spiritual Literacy. Copyright © 2011-2014 Jewish Spiritual Literacy, Inc. Although Jesus was Jewish, this is not a site to find Jesus books. There are also no geographic correlations, such as Jewish books from New Jersey. Finally, while we had help from a global team of programmers, this site was not made in China.